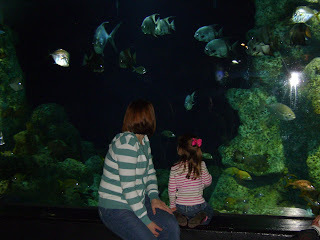 This past Saturday we took the girls to the Aquarium. It's pretty nice and they are continuously adding exhibits and building on to it. We found out we could get a Family Pass for $42.50 for being hometown residents! 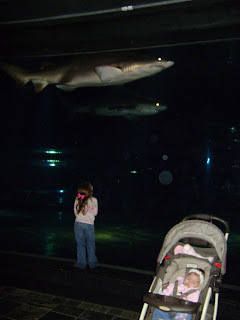 To go to the aquarium anytime we want for a whole year for that cheap is TOTALLY worth it! We will pay for the pass in less than 2 visits! The pics didn't turn out that great, but here are a few. Bailey just couldn't make it through the whole thing! 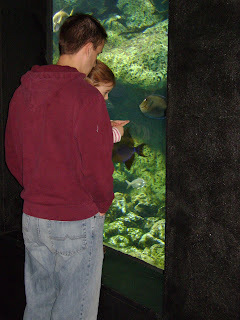 Tom and Grant just spent a rainy day at the Aquarium last week! 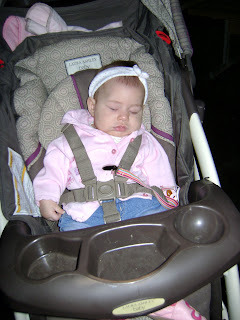 Looks like Bailey had a great time, hehe, I wish they had strollers for adults, hehe!